In a recent webinar, we interviewed Cloud County Community College’s Marc Malone (Associate VP of Planning and Assessment) and Southern Maine Community College’s Jason Saucier (Director of Campus Life) to find out how they are leveraging their campus app to unify communication, track data, and assist with outreach. 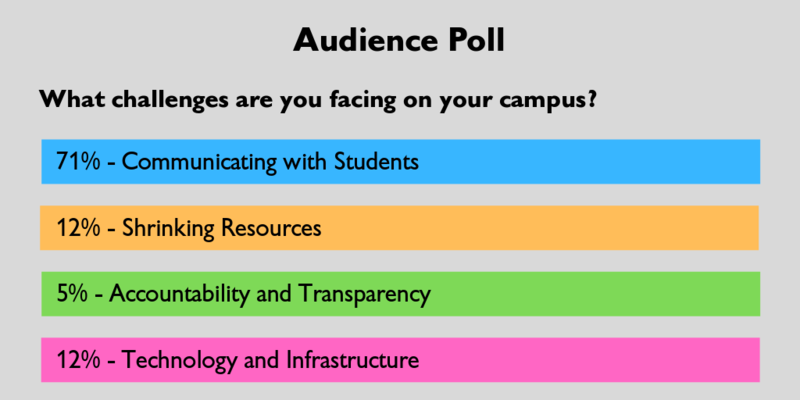 Question: What were some of the biggest challenges that your campuses were facing prior to adopting the app? Marc Malone: Before adopting the app, Cloud was seeing declining enrollment (persistence, retention), and declining financial resources (enrollment, state funding). We also had trouble communicating with students (billing, meeting and event attendance, clubs/groups), student engagement, and self-efficacy. Jason Saucier: Three of the main challenges we were looking to overcome were declining enrollment, lack of effective communication with students, and low student engagement. Q: Jason, can you give us an example of this? J: The campus email is the official communication channel; however, it is not uncommon that students miss important emails. We had a bumpy starts to our fall this year when we had to close one of our residence halls a week before opening due to some facilities issues, so we had to put 300 students into hotels. We had planned a day to move these students back to campus; we sent email after email, we put flyers under their doors, we had flyers in the hotel lobby, and we still found students posting on the app “when is moving day?” Thankfully at that point we already had the app and were able to post all the relevant information on the campus wall. Q: How did you justify the purchasing of a campus app? M: In September 2017 we had an strategic planning meeting where admins across campus were given an avenue to express their opinions. One of the main issues that we decided we wanted to focus our attention on was increasing student engagement, which included increasing participation in events, clubs, organizations, and co-curricular events. ‍Q: How did you gain meaningful adoption of the app? M: Tying the app to a larger project was key in promoting adoption. Once everyone was aligned in that we wanted to increase student engagement on campus as part of our strategic plan, and that the app was going to be the avenue to do so, it became easy to promote. It also made it easier for us to prioritize financial resources to fund it, since multiple departments would benefit from the app. The overall three-year completion rate for community college students nationwide was 24% for the 2000 cohort and 20% for the 2010 cohort. We’d like to thank both Marc Malone and Jason Saucier for their time and feedback. If you think your campus might benefit from an app, or if you have any questions, feel free to reach out!